Home > Services > Articles & White Papers > Birds of a feather: Using affinity brands to understand and inform your brand. Birds of a feather: Using affinity brands to understand and inform your brand. Of course, you might find that there are widely diverging perceptions of what your brand qualities are that could be an indication that your organization is in need of a bit more focus, or at least introspection. During a client meeting a few years ago, I watched as one participant declared that Ritz-Carlton was an affinity brand. The other participants almost immediately disagreed (respectfully), pointing out numerous reasons why their services were not up to the standards of a super-premium brand like that. But the ambitious suggestion helped the group get closer to what they did feel comfortable with, which was Courtyard by Marriott. When using the affinity brand exercise, the hotel category is one that is particularly helpful because there are many recognizable brands with well-known brand personalities and tiers of costs and services. This allows the exercise to pinpoint an appropriate level for your brand, as well as suggest affinity brands for your competition. Thus, your brand might be perceived as similar to Hampton Inn and your major competitors might be more like Motel 6 and Hilton. Keep in mind that it’s important to avoid personal biases toward brands in this exercise. Someone who had a bad experience at a Hampton Inn may not have the same perception of their brand as a person who has had nothing but good experiences. (The same is true of your customers, as well. One negative encounter can taint their view of your brand indefinitely.) 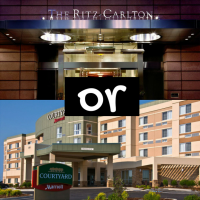 So, it can be helpful to point out that Hampton Inn is a strong and growing brand, or to suggest a close comparison like Holiday Inn Express as a replacement. Occasionally, the converse may occur as well. You may find too many mentions of affinity brands that are not quite what you would like it to be. Maybe some of your team thinks BMW, but the others think Kia. Maybe the truth is somewhere in the middle. But again, use this as a checkpoint moving forward, so you can move toward a greater consensus on your brand and how it fits in the marketplace.